Task Dependency is a relationship in which a task or milestone relies on other tasks to be performed before it can be performed. This is also referred to as a logical relationship. A logical relationship can be a dependency between project tasks or between tasks and milestones. Understanding task dependency is a key element in project management. It does not matter how good a project schedule is, if critical dependencies associated with the project are not included in the description of the effort, they represent considerable risk to delivering project value. Effective project management begins with the end in mind. The goal of a project is always successful completion. Setting task dependencies between tasks is the most powerful feature of Gantt Excel. The in-built auto-scheduling automation of the template is able to update the dates of tasks based on changes that are made to its dependent tasks. 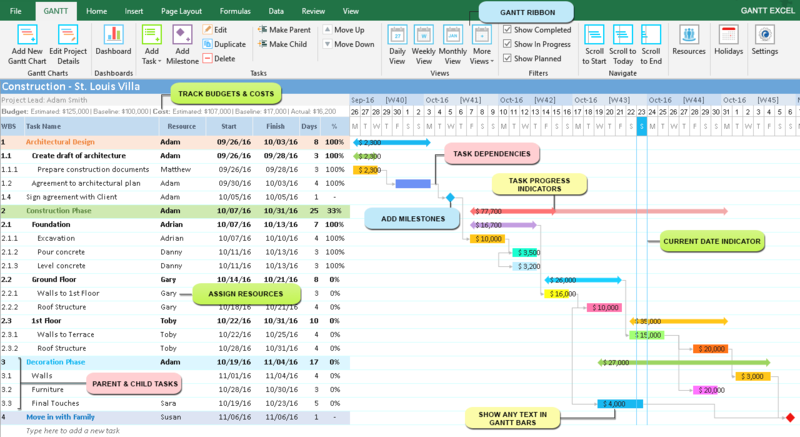 Gantt Excel is the only Gantt chart excel template with task dependencies. Create Gantt Charts in Microsoft Excel 2007, 2010, 2013 & 2016 on Windows & Excel 2016 on macOS. It is important to understand the types of task dependencies that can be used in Gantt Excel. This is the most common type of dependency between tasks and a type that is used most often. In this scenario, the predecessor task must finish before the successor can start. This dependency means that if there are 2 tasks TASK A and B, the dependent task (B) cannot begin until the task that it depends (A) on is complete… In other words, if TASK A is delayed by a day, then B will also be delayed and will begin a day later. The “Start to Start” dependency says that a task cannot start before the predecessor task starts. This dependency means that if there are 2 tasks TASK A and B, Task B can’t start until Task A starts. They don’t have to start at the same time: Task B can begin any time after Task A begins. Example: To save time, you want to level concrete at one end of the foundation while it is still being poured at the other end. But Level concrete (B) can’t start until Pour concrete (A) has also started. In this case, a task cannot end before the predecessor task ends. This dependency means that if there are 2 tasks TASK A and B, Task B can’t finish until Task A is completed. They don’t have to end at the same time: Task B can end anytime after Task A ends. Example: Your team is adding the wiring to the building and inspecting it at the same time. Until Add wiring (A) gets done, you won’t be able to finish Inspect electrical (B). One peculiar dependency, which is rarely used, is “start to finish”. In this case, the predecessor task must start before the successor task can finish. Task B can’t finish until Task A begins. Task B can finish any time after Task A begins. This type of link is rarely used. Example: The wooden window frames for your house are built off-site. You can’t finish Assemble windows (B) until Window frame delivery (A) begins. As a rule of thumb, a good practice is to stick with the common Finish to Start dependency or else you run into the risk of creating a very confusing gantt chart. Predecessor and Successor are two types of dependent tasks that belong to one and the same project or process and that are performed under dependency rules. A predecessor task determines the start or finish date of its successor task. Both types are available in any work breakdown structure that includes dependent activities. Dependency rules between tasks determine which of the tasks are predecessors and which ones are successors. Graphically it can be presented as a tree-like structure in which every higher level is the successor of its lower level, and vice-versa – every lower level is the predecessor of its higher level. Essentially, the dependency between tasks and sub-tasks is the predecessor-successor relationships. Such relationships are used in various project management methodologies.